Lawmakers in Congress are reportedly considering a budget deal that would effectively cut pay to federal employees, and some members of both parties have voiced their stark opposition to any such measure. Negotiators in a conference committee created as part of the deal to reopen government after the 16-day shutdown in October have until Dec. 13 to recommend a plan to fund government past Jan. 15. Rep. Paul Ryan, R-Wis., and Sen. Patty Murray, D-Wash., the respective House and Senate Budget Committee leaders and their parties’ head representatives in the conference negotiations, are discussing increasing federal employees’ contributions to their retirement pensions as part of an effort to offset some of the scheduled budget cuts known as sequestration. President Obama included in his fiscal 2014 budget a proposal to increase feds’ retirement fund contribution from 0.8 percent of their salaries to 2 percent, and House Republicans also pitched that change Tuesday in a bill to offset just the Defense Department portion of sequestration cuts. While the details of any conference committee deal remain unclear and are still being negotiated, several lawmakers from both chambers of Congress blasted any cuts to federal employees’ pay or benefits. 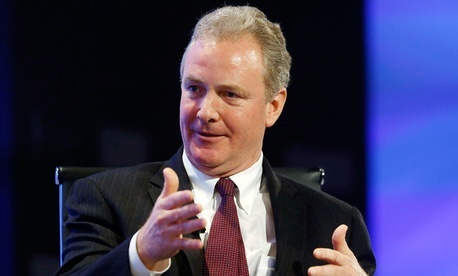 Rep. Chris Van Hollen, D-Md., ranking member of the House Budget Committee and a member of the conference committee, told Government Executive federal employees should not have to give up any more in pay and benefits than they already have. In a letter to budget conference leaders, Sen. Barbara Mikulski, D-Md., noted the ongoing, three-year pay freeze as one of many cuts the federal workforce has been forced to endure. Rep. Frank Wolf, R-Va., also penned a letter to the heads of the conference committee, saying federal employees have repeatedly “been used as pawns” during previous budget negotiations and that he would vote against any bill that further targeted them. New federal workers already face significantly lower paychecks than their longer-tenured co-workers, as a 2012 budget deal required post-2012 hires to contribute 3.1 percent — rather than 0.8 percent — to their retirement pensions. Federal employee groups and unions have repeatedly denounced any effort to target federal employees in a budget deal. Joseph Beaudoin, president of the National Active and Retired Federal Employees Association, said in a letter Wednesday feds have already contributed more than $114 billion toward budget reduction. “No other group of American workers [has] been asked to give up financially to their country the way federal employees have,” Beaudoin wrote, adding the current dynamic sets up a lose-lose situation for NARFE members, who will either see less pay from pension contribution hikes or from furloughs necessitated by the continuation of sequestration.